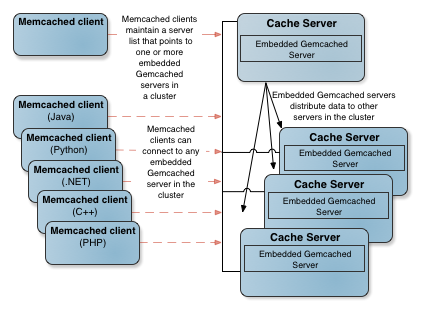 To integrate memcached with Apache Geode, you embed a Gemcached server within a Geode cache server. These Gemcached servers take the place of memcached servers. The memcached client uses its normal wire protocol to communicate with the Gemcached servers, which appear to the client as memcached servers. No code changes in the clients are needed. Geode manages the distribution and access to data among the embedded Gemcached servers. Read-through, write through, and write behind to a database, implemented from within the distributed Geode cache.